Looking for a kayak built for two? The Perception Pescador 13 Tandem is perfect for single and duo kayakers alike. What’s most noticeable about this affordable model is that it’s amazingly comfortable, even for two. For those just starting out in kayaking, or for those who are looking for a comfier, less awkward drift, this may well be the kayak you’ll want to invest in. 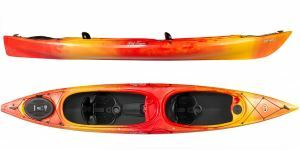 The Pescador 13 Tandem kayak is well-known for its ease of use and effortless precision. While some buyers may be looking for a comfy ride out that fits two people with ease, others will be looking for a kayak that can really glide across the water. The Tandem 13 keeps you safe and secure, too. There’s no risk of either of you getting too close to the water’s edge. Therefore, it’s an excellent purchase for beginners or training purposes. What needs to be noted is that you may need to buy equipment yourself. Oars and other accessories may be supplied separately. Therefore, if this is your first kayak, it’s worth stocking up on the essentials to avoid disappointment. This can include hatch bags or other storage accessories you may require. It’s also perfect for fishing. There’s little need for manual adjustment, though it’s worth bearing in mind that there are no adjustable seats on board. For couples and duos looking to get out on the water, it’s a fantastic entry level purchase. Sea Eagle Boats is a trusted name in kayaks and other water-faring standards. Their FastTrack 465FT Deluxe Package is an impressive-looking kayak – but does it stand up to thorough testing? Offering what’s marketed as innovative design and stability, it’s a sea-ready standard for small groups of paddlers. This is an inflatable kayak which can hold up to three people at any one time, to a maximum of 794lbs / 360kg. One massive loading capacity. For such a lightweight and simple construction, it’s incredibly hardy even when you take to choppy waters. For those paddlers looking for comfort and space, as well as a vessel to carry more people, the FastTrack is an option worth looking into. The expansive storage here should appeal to adventurers of all ages. While some kayaks sacrifice storage for comfort and vice versa, you really do seem to get the best of both worlds here. The inflatable keel and asymmetric design of the boat help to provide incredible stability, too. When it comes to team kayaking, storage, comfort, and stability are all essential. Far too often, it’s difficult to get two out of three on point. While it’s entirely possible to sail the FastTrack alone, it’s probably better for team sailing. To that extent, some may find the design a little bulky or even cumbersome if they don’t need such an extensive model. It’s still amazingly lightweight given the experience it provides. Your experience and tastes may vary. The FastTrack may be a little too cumbersome for single kayakers, but hey this is a tandem kayak! Family kayaks can be hard to come by, especially those which offer safety and stability. Old Town’s Dirigo Tandem Plus somewhat breaks the mold in that it’s a three-person boat disguised as a tandem! Offering two distinct and secure cabins for adult paddlers, there’s also a third jump seat which can be removed and reattached. Perfect for couples with young kids! Old Town is a well-regarded brand and this lightweight kayak more than offers the security you need on the water. While some of the brand’s older models may be less hard-wearing, the Dirigo Tandem is built for regular adventures. What’s most striking about this kayak is not just the safety features, but the storage capacity. It’s a kayak made to transport two people (maybe three) and everything they need across various expanses of water. Dry storage is an asset here, though there are kayaks which offer more space in this regard. It’s the perfect first kayak for new paddlers, too. Durable, easy to maneuver and trustworthy across the water, this is a boat you can comfortably sail in without fear of losing control or any of your essential items. It’s not the heaviest of kayaks out there, though it is still recommended that you move the boat with at least another person to hand. You’ll also need to source paddles and equipment yourself. For most paddlers, this shouldn’t be an issue! However, it’s worth bearing in mind if you’re just starting out. Wilderness Systems’ Tarpon 135T is supposedly one of the speediest kayaks around. It certainly looks the part, with a sleek, streamlined design helping to appeal to new and seasoned paddlers. It’s the features, however, which mostly count. For families and teams, you can easily fit two paddlers in one sitting with comfort and security. Security is probably where this kayak shines the most. While it already boasts two rigid seats, it also arrives with foot braces and round hatches. That means that, unlike many other kayaks on the market, it is armed with superb stability, safety and even storage in one package. You’ll be able to regularly cast the Tarpon 135T into the water with no concerns. This is a heavy duty tandem kayak with plenty of power in water cutting. That means that it’s designed to sail through even the heaviest of current without a bruise. For the most part, it definitely paces well, keeping ahead of other two-person models available. 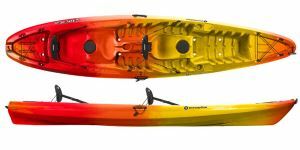 It’s also available in two colors – or flavors – both of which are striking to even the most seasoned of kayakers. Is the Tarpon 135T suitable for training or first-time paddlers? With some guidance, probably! What must be noted is that it is a reasonably bulky unit compared to competing kayaks, meaning that it may be difficult to pick up, carry and transport without a few people on hand. However, once it’s on the water, the weight is literally off your mind. It sails as if it’s half as heavy! 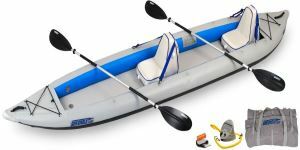 As the name suggests, the Malibu Two XL Angler tandem kayak was designed for two people, primarily for fishing purposes. 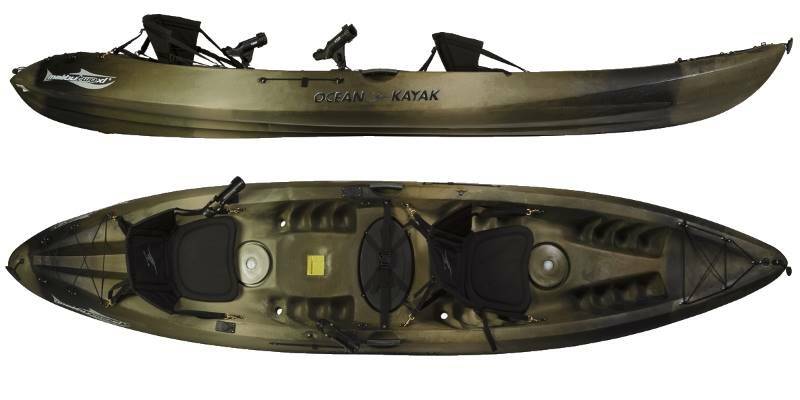 This kayak is ideal for couples or a parent introducing a child to the magic of kayak fishing. XL by name, XL by nature? This sizeable boat is an excellent purchase for first-time paddlers and is certainly worthy of consideration for families. Safety is key here, as there are two seats offering incredible security in line with the overall stability in the boat’s design. This pleasing-looking tandem kayak is also relatively lightweight. You’ll likely need someone to help you carry it, however. This tandem kayak is marketed towards families. It’s definitely a solid purchase for those looking to get their kids out on the water. Its stability is relatively understated, as while it does have a rather simple look, you can easily control the boat even with just one paddler at the helm. Even though there is space for two people, there is still plenty of storage space for fishing equipment. This is a kayak that has been designed with functionality in mind, and you can pack all your fishing essentials. However, the kayak isn’t overly bulky or heavy, so you should find carrying it is simple, especially for two people! 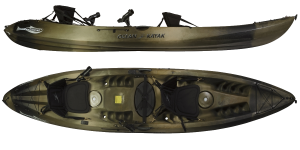 The Malibu Two XL Angler is a sit-on-top, tandem or solo kayak, or could be used with a third small individual in the middle. It is best for all kind of fishing and recreational activities in lakes, rivers up to class II, ocean, open sea, coastal water. Tracks and maneuver well even by a solo paddler. We recommend additional rudder kit. Difficult for a solo car-topping due to the weight. A bit slower than the other rigid kayaks. 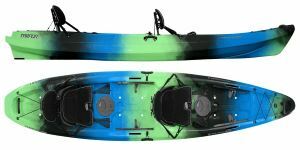 There is a degree of customization available with the Malibu Two XL Angler tandem kayak. Anyone looking to use it by themselves, as opposed to with two, will find it can be set up quickly. The overlapping foot wells are a fantastic touch, ensuring comfort for everyone when out at sea. You’ll find the broader beam areas of the kayak helps to push through the water’s surface without compromising on speed. This addition also provides more steadiness for your ride, which is ideal for families. The Malibu Two XL Angler tandem kayak delivers a dependable kayak that you’ll be delighted to use many times. The dependable and spacious nature of this kayak makes this a perfect choice for families. It is for sure a great deal! The one thing most people love about 2 person kayaks, is that you can get onto the water with a friend. There’s nothing like having a chat with a good friend or your partner as you take in the sights is there? In fact, I’d probably go as far to say that if you’ve never tried it, you’re missing out. As you can tell, I’m passionate about all things on the water. So I want to give you the benefit of my experience and put together a walkthrough guide. That way, when you come to choose between a single and tandem, you’ll know which one is for you! What is a sit on tandem kayak or 2 person kayak? It sounds like a bit of a mouthful, doesn’t it? Well, I don’t blame you for looking it up, because when I first heard the term, I was compelled to find out more. 2 person kayaks are where you sit one person behind another as you make your way down the river. The great thing about this is that you can enjoy some good company while taking in fantastic views. If you want to know why so many people regularly tandem kayak, consider the social element. The great thing about them is, they allow you to explore the outdoors while having a good laugh at the same time. Now, without further ado, let’s take a look at some of the benefits of tandem kayaking. One thing that people often compare tandem kayaks too is tandem bikes. It’s only natural I suppose, owing to the name, but they’re a lot more fun than their land-based equivalents. While anyone can tip a tandem bike in the blink of an eye, kayaks are more stable when a second person gets onboard. They’re a little longer to accommodate that second pair of legs, which gives the craft a larger profile on the water. Something which is ideal if you want to make it harder to capsize. It is still possible, however, particularly if you haven’t mastered the art of teamwork. Don’t worry though; it will come in time. Working together in а tandem kayak or 2 person kayak — how tricky is it? I drew the parallel with tandem bikes and then told you that the water versions aren’t anywhere near as wobbly. Something which will have come as a big relief to many of you I am sure! The secret to staying upright is teamwork. You need to be able to coordinate your strokes if you want the kayak to go straight and true through the water. That is really important for preventing it from pitching from side to side as your strokes fight one another. It will also allow you to glide through the water with the effortless grace of that pro couple you always bump into. What I love about this, is that it gets you working with someone for hours at a time. I find that 2 person kayaks are better for my stoke as well. I’ll say a little more about this shortly; but first, what do you do if you capsize? Capsizing is never fun, but if you know what to do when the inevitable happens, then you’re well prepared. Probably the key thing to remember when you capsize a tandem is to make sure your partner is okay. You’ll also want to stay nice and calm, just in case they find it a bit of mental challenge to get back in the boat. Let me give you an example. Imagine you capsize with a rookie in the back, what are you going to do? Well, as the more experienced paddler, I would say that it’s on you to control the situation. The two of you should have discussed what to do back on the shore, but there’s every chance the cold water has shocked your partner. That is natural, and the only thing you can do to is to lead by example with a level head. You then have two options about which way you can to proceed. You can either use your muscle power and technique to flip the kayak over and bail out any remaining water. Or, if you’re close enough to shore, you can each grab hold and use it to swim back. Whichever one you choose is up to you. Just make sure you assess the ability of your partner before making the decision. Provided you’re on the same page; you’ll be fine. Does paddling in tandem help improve your stroke? This may sound a little bit counterintuitive because you’re pushing with the help of someone else. I’m not going to disagree with that. However, if you want to generate lots of power and become a sprinter, then tandem paddling may not be for you. But that’s a pretty specific niche to get into in the first place. When I talk about improvement, I’m not talking about raw power, or even about endurance. I’m talking about timing and technique. If you’re super fit but have no technique, you’re not going to have fun on the water. Paddling in time with someone of similar ability will train you to focus on the mechanics of your stroke. Ever got home and your back, core, and shoulders are uncomfortable? Well, I have, and I can tell you it’s no fun at all. I started paddling for fun with my partner, and I haven’t felt a pinched nerve since. I’m not a sports scientist, but if you paddle in unison, your stroke will improve, and painful niggles will disappear. Are there places a 2 person kayak isn’t welcome? Unless you’re planning to enter a race, then you can use your 2 person vessel wherever you want. That is great news if you’re planning a trip with a friend or partner. One thing I would say, however, is to only go as far as the less experienced is happy with. There’s nothing to be gained by trying to show off your ability, or by pushing your partner too far, too soon. All that will do is put you both at risk, and potentially cause friction and stress when on the water. Keep to your limits, and as you become an experienced team, head off to more exciting places. Room enough to take some camping gear? If you get the right boat, then there will be plenty of space. But as with anything, tandem kayaks come in all shapes and sizes. The critical thing to do is to buy one with a partner in mind. It’s no use taking your 5’1 wife one week and having lots of space. Only to complain the week after that your 6’4 best friend is taking up three-quarters of the kayak. Plan ahead by measuring up for what you’re likely to do, and don’t forget to take some bags with you. That brings us nicely onto my final idea: what to look for when you’re buying. What are the specifics to look for when buying a tandem kayak? The key elements to look out for are similar to a solo kayak. You want to ensure you have enough space for you, your partner, and any equipment you want to take with you. You’re also going to want to make sure you’re both comfortable in the seats. Tandems tend to come with the same seats front and back. But if one of you is particularly uncomfortable, then the store may be able to help you modify one of the seats. Something you may not know is that some tandem kayaks also come with a rudder. The idea is that the person at the rear can help set the course, as the one at the front does more of the paddling. I’m not sure if everyone will be clambering to use the rudder. If you want to try something different, then why not give one a try. Other than that, make sure there are comfort-grip rubber handles to get to and from the shoreline and you’re all set! Tandem kayak, like any other, has its advantages and disadvantages, but it all depends on what you like and want, really. You might have to consider what you need it for, where you need it on and whom you’re paddling with to help you make your decision. There is so much to love about tandem kayaks, the efficiency, and speed of bolting across water even as a beginner, knowing you have an expert with you is just one of the regular advantages of tandem kayaks. To put things in perspective, here are just a few reasons to get a tandem kayak today. Family paddling can be fun, affordable and safe with tandem kayaks. A tandem kayak is stable enough to accommodate their constant movement and restlessness. You can also bring your family pets without having to worry about damage to your boat at all. Some tandem kayaks even come with a third removable seat. You can put your dog for example, and as long as you make sure you can guarantee the dog’s safety. Where you sit your kids in the tandem kayak largely depends on their age and how big they are. A front row seat allows your child the chance of an amazing view first hand while you paddle efficiently at the back. Beginner or not, if speed is what you need, tandem kayaking is just right. Speed is generated because there are at least two of you paddling and with proper teamwork, you can reach far destinations in no time. The trick to this is to paddle in unison while the stronger kayaker sits at the back to control the pace. Because there are two people in the boat, you both have the flexibility to do whatever you want. You can decide to paddle together to reduce the load on each of you or go with paddling in shifts to allow the other person time to rest and do other things like fish or take photos. Where you lack experience, stability comes to play, and this is where a tandem kayak thrives; because they are so robust on water, they ensure you a stable, comfy trip. You know those times when you were caught between bringing more equipment with no space on a single kayak. Tandem kayaks are always available with enough space for those times. Tandem kayak has enough space to handle equipment, food, and drinks for long trips, but you might want to slow your role on that because too many loads will ultimately slow you down on water. Tandem kayaks are very effective for safety when out with family or friends, and someone gets injured. You can whip such person in your extra seat and paddle to safety to get help. One person can power a tandem kayak, and I bet you also agree its better than towing a solo kayak with an injured person on board. At the end of the day, the size of your pocket is the driving force behind any love for kayaking. While tandem kayaks are more expensive than solo kayaks. It’s cheaper to buy one tandem kayak than two single kayaks. You have to look at it as an investment opportunity; you can paddle alone when your partner is to busy to paddle, and you can paddle together when you’re both free. It’s better than letting one while away in the store. CHOOSING THE BEST TANDEM KAYAK. There’s a whole lot to consider when choosing your tandem kayak; the choice you make will go along way in ensuring your comfortability and safety out on the water. It would help if you considered these factors when choosing a kayak. The material of a tandem is what was used in constructing it. You should not undermine the importance of material used for your kayak because it controls not only beauty but the performance, stability, and durability. kayaks are made with the following materials. Rotomolded kayaks, otherwise known as polyethylene kayaks are cheapest and most commonly used type of kayaks. Made from plastic, heated and rotated in an oven to form the kayak shape, polyethylene kayaks, heavy, are robust, durable and can be managed for long periods with little care. Blending of different high tech fabrics like carbon fiber, graphite and aramid ensures the stiffness and the swiftness that allows a kayak respond excellently on water. Mostly owned by professional kayakers, it is an expensive solution to the damages that affect hull speed. Scratches can be easily fixed, and they play no role in the general performance, but composite kayak stiffness can make it vulnerable to attacks to sharp and direct impact. Made from poly-based fabric that provides shape and rigidity. These used to be discarded, but recent technology has allowed them more durability. They are now puncture-proof and super strong. They are gaining on other kayak types in popularity because they are lighter and compact. They are also foldable so they are easier to store and carry along easily for a long trip. Hull shapes come in different designs and shapes all depending on what you need the kayak for, and your level of proficiency. These are the most common, and for a good reason. Their wideness allows for stability in calm conditions; they are also very quick and easy to control. Flat-bottom kayaks are used for a variety of activities, from touring, fishing to just having playful fun time on the water. This torpedo-shaped tandem kayak tracks excellently and has incredible speed. They are most efficient in rough conditions because they tend to be slant toward one side or another. Due to their “V” shape, these tandem kayaks are the fastest in a straight line. However, they are marred by less stability and controllability. They will feel less safe in rough conditions. A kayak’s weight capacity is the amount of weight it can hold while staying afloat and avoiding water in the kayak. Although kayak making companies announce their slated weight capacities, it is advised that you do not load up to its full capacity to ensure optimal performance. Are you tall or short? Is there enough leg room for you? How’s the cockpit? Are there storage hatches? These are a few questions you should ask when getting a kayak because every single detail no matter how seemingly insignificant plays a major in the overall performance of the boat. For example, a small cockpit allows for more control while a bigger one makes it easier to get in and out. Accessories provide a whole lot of incentives in enjoying your kayak and being safe at the same time. Accessories like spray skirt, a rudder and skeg are always like an extra helping hand in the control and maneuver of kayaks. Paddle in unison: The most efficient way of paddling a tandem kayak; not only will this give you an incredible edge in paddling forward, but you will also avoid clashing paddles in the course of paddling. Rhythm is the key to performance in this technique. Stronger paddler in the back: When paddling, the stronger, more experienced paddler should be sitted in the back. This way, he is responsible for the control while the person in front dictates the pace. It’s important because the back- paddler can modify the speed and control the boat from the back in case the front-paddler gets tired. Turning your tandem kayak: A fun and easy skill to master. When it comes to actively turning a tandem kayak, teamwork is heavily influential. Basically, the front paddler employs a forward stroke at the same time the back paddler does a reverse sweep. If done, uniformly, this will turn the kayak very quickly and efficiently. So the next time you’re planning to introduce your friend to the beautiful sport of kayaking or just planning a chill trip with family and friends, and you need more space for your stuff and pets. Tandem is your go-to. 2 person kayaks or tandem kayak are a great way to get out onto the water and experience the wild. They let you add a much-needed social element to those hours spent on the water. In my opinion, this makes them ideal for longer trips and overnight stays, of course, on the shore. There’s just nothing like the camaraderie of loading up your kayak and setting off on an adventure together. One thing is for sure; if you have as much fun as most do, you’ll have a lifetime of adventure stories to tell!